Home / Family / What Father has to do In Father-Daughter relationship? 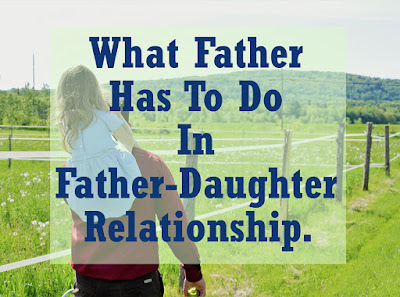 In a father-daughter relationship, a father has an important role in the life of his child, especially girls. A daughter will apply the standard to men by looking at their father's behavior from childhood. A dad's involvement in his daughter's life can have a big positive impact on a young girl's life. It is crucial for her development into a strong and confident woman. The most important thing a girl needs from her father is love and affection. Dad is an example. The first man loved by a girl. Surely she wants her love to be reciprocated so that someday she can confidently seek the true love that becomes her soul mate. Don't make your daughter doubt your love. Tell your beloved daughter that you love her, as much as possible, every day. She noticed the way her father treated her mother. Loving mothers from children is the best way to ensure family happiness. Because children love their mothers, and they also want to see how his father treat her mother. Father has an influence on her future husband. The personality of a father will be a picture for a daughter to choose her future husband's figure. If you are a good father, and a good husband, then surely, sometimes, your daughter will marry someone who has a personality like her father. Every father must realize that they will not be forever on the side of their little princess. Make as many memories as possible about your togetherness with your daughter. Later when she is married and has her own family, she will always remember these memories and make them an example to make memories with her children. It's easy to be selfish when a child is always spoiled and always obeyed by her wishes. This is where the role of a father is needed, to open the eyes of the child, that everything in life is not just about her. Teach her the beauty of sharing, succumb for good, and sacrifice for others. So that she can become a better person, and be liked by many people. The presence of parents in important events in the life of a child is very meaningful for a girl. Whether it is taking report cards, competition events, or school performances. Surely, my father's presence will make the beauty feel very happy, because in the midst of the busy life my father made a living, still had time to attend the event he attended. This is proof of Father's indisputable love. What your daughter needs is not only a physical presence but also emotional. There will be no meaning if you accompany the child but instead is busy with your cell phone. Get rid of your gadget, and play with it, because its children will not last long. Dating with your daughter can give her an idea of how a man should treat a woman while on a date. No need to spend too much money, just walk around the blocks, eat ice cream together, take a picture, play in the park. Your togetherness with your daughter will remain in her memory. Let her cry if there is no other way to solve the problem. Let your daughter release her sadness, anger, and displeasure. If your daughter often cries for trivial things, remind her. Do not be too late to improve her attitude, or she will grow into a whiny woman. Apologize if you make a mistake. A father who apologizes does not mean he is humbling himself. It is actually teaching his child, that if you make a mistake, you must apologize. What a girl needs when the father hurts her, or does something that makes her sad, is a sincere apology from the heart. That way, he will understand the importance of apologizing when doing wrong. Don't withdraw from her when she grows up. A daughter still needs their father's presence, even though she has entered adolescence, as well as adults. She still needs a figure for a place to learn, seek advice, or just a place to vent. Every father should keep the bond with their daughter. Also, read Am I Ready to Become a Father?